The branching workflow is usually used with specific guidelines about how to use and name branches. A general rule of thumb is that each branch should be specifically named and used for a defined purpose. See the Forking and Branching section for detailed steps about how to create branches. The following code examples correspond with the numbered steps in the diagram. Setting up a branching workflow requires giving users access to the repository. For more information, see the Repository Administration section. 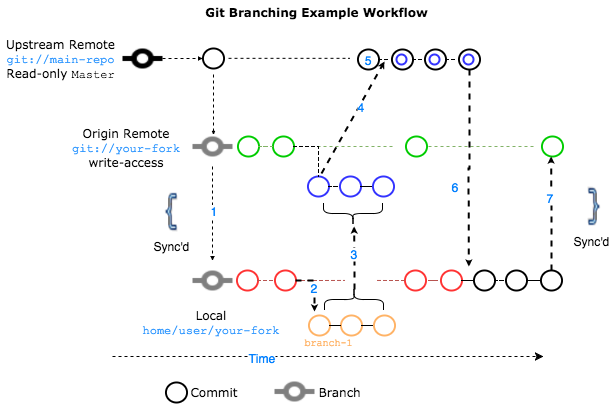 If you are on a team that uses a branching workflow, see the Forking and Branching section for how to create branches, and also the Pull Requests section. You may also find the How to Squash Commits in Mercurial section useful.